Part of the banner image for an Etsy shop created for Charlie, the youngest child of Hereditary’s Graham family. If you saw Hereditary when it came out this past weekend, chances are the creepy horror movie is still under your skin, despite any effort to scrub or claw it away. That’s exactly the way writer/director Ari Aster wants you to feel. io9: One of the things that stuck with me was how long the runtime is— and how it serves to build the dread throughout the pacing of the movie, which felt deliberately slow to me. Can you talk to me about those mechanical decisions you made? Ari Aster: If anything, I really, really wanted people to live in these very extreme emotions. Even while I was pitching the film—before we had anybody attached, before we had financing—I would describe the film as a family tragedy that warps into a nightmare. And I was kind of careful not to call it a horror film. It is a horror film, and I hope it’s a very good one. By which I mean, I hope it meets the demands of the genre in a satisfying way. But it was important for me to attend to the family drama first, and to have all the horror elements grow out of that. And just because you mentioned Millie, I feel like I need to quickly address what she did in the film—because I think she is an extraordinary young actress and she is nothing like Charlie, the character she plays. I think it’s a testament to how great she is that one can’t imagine her being any other way. She gives a really hypnotic performance in the film, but she’s actually like the happiest, most precocious kid you ever met. She has a Tony that she won when she was 10 years old for playing Matilda on Broadway. I think we’re going to be seeing a lot of Millie. 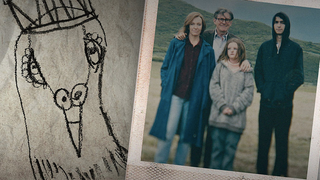 Hereditary is in theaters now.